Journalist and politician; born in 1865 at Hull. For some years he lived at Newcastle-on-Tyne, where his father, E. Cohen, acted as Ḥazzan. He went to London in 1888, and was on the staff of "Ariel," the paper conducted by Israel Zangwill. Later he established the journals "Commerce" and "Finance," of both of which he is (1901) the editor. These and "The Topical Times" are among the journals owned by his firm, "The Columbus Company, Limited," of which Cowen is the head. He is the founder and honorary secretary of the Article Club, an institution including most of the chief manufacturing firms in England. In 1899 he received the Knight Commander's Cross of the Order of Takovo, for services rendered in furthering the commercial interests of Servia. In Oct., 1900, he unsuccessfully contested Coventry in the Liberal interest. 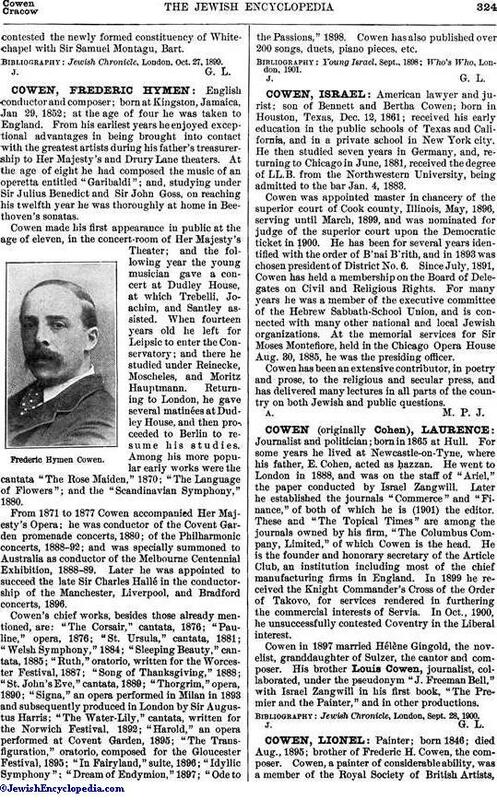 Cowen in 1897 married Hélène Gingold, the novelist, granddaughter of Sulzer, the cantor and composer. His brother Louis Cowen, journalist, collaborated, under the pseudonym "J. Freeman Bell," with Israel Zangwill in his first book, "The Premier and the Painter," and in other productions. Jewish Chronicle, London, Sept. 28, 1900.